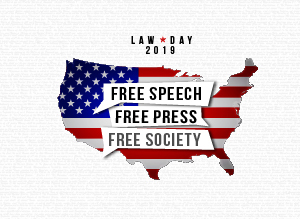 Since the first observance, the American Bar Association, the national voluntary organization of the legal profession, has acted as the national sponsor of Law Day. State, county and local bar associations organize individual projects throughout the country. Many national organizations also recognize Law Day, including the National Education Association, National Governors’ Association, United States Conference of Mayors, Boy Scouts and Girl Scouts of America and civic and services clubs such as Rotary International and Kiwanis International. In 2005, the American Bar Association honored the OBA with the Outstanding Law Day Activity Award. The theme for that year was “The American Jury: We the People in Action.” A record number of Oklahoma students — more than 2,000 — participated in various art and writing contests. Local and state government organizations encouraged citizens to recognize Law Day through various community events. For Downloadable Contest Forms please select from options below. *source: OBA Public Outreach. For more information please click HERE.